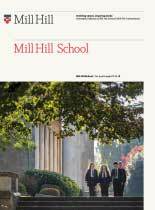 Mill Hill School was founded in 1807, when its founders wisely chose its location on the top of a hillside for its fresh air, safety and natural beauty. Mill Hill’s family of schools offers co-education from ages 3-18. Grimsdell Mill Hill Pre-Preparatory School is a day school for pupils aged 3-7. Belmont Mill Hill Preparatory School is a day school for pupils aged 7-13. Mill Hill School and Mill Hill International are boarding and day schools for pupils aged 13-18. At Mill Hill School the welfare of each pupil has long been recognised as a strength of ours and our pupils are supported throughout their school career. We aim to provide an environment that is both caring and supportive.